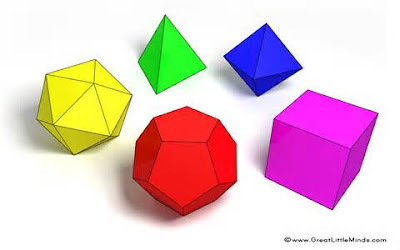 Pat'sBlog: Which Platonic Solid is Most-Spherical? Which Platonic Solid is Most-Spherical? The table gives features of the Platonic solids when inscribed in a one-unit sphere. At first I thought they must have made a mistake, but not so. The Dodecahedron fills almost 10% more of a sphere (about 66%) than the icosahedron (about 60%). So the Dodecahedron is closer to the sphere than the others. Interestingly, if you look at the radii of the inscribing spheres, it is clear that solids which are duals are tangent to the same internal sphere. When you put the Platonic solids around a sphere, the one smallest, and thus closest to the sphere is the icosahedron. Here is a table of the same values when the surface area (superficies) is one square unit. Notice that for a given surface area, the icosahedron has the largest volume, so it is the most efficient "packaging" of the solids (thus more spherical?). I guess that makes it 2-1 for the icosahedron, so I wasn't completely wrong all along. I think it's about points of contact. On the inside, the dodecahedron touches the sphere at the most points (20), and on the outside, the icosahedron touches the sphere at the most points (again 20). Wow! No way would I have thought is wasn't the 20-sided die (former Magic:the Gathering player here), the Dodecahedron. That's pretty wild. However, when it comes to "packing", nothing beats the ovoid, the M&M's shape, right? That's wild as well. I think "most-spherical" would need to be better defined. Not that I want to do it (and not that I am certain that I could), but perhaps summing the squares of the distances from each point on the surface of the solid to the closest point on the sphere would be the way to go (like a sort of physical variance). But as I say, I'm not sure I could do this (maybe I can kill some time today, I'm visiting a puzzle-friend), and I'm not sure that it makes a lot of sense. Oh, oh, and inscribe or circumscribe or find the best match in-between? What a fascinating post! Here is a nice way to think about your first result in terms of the empty space. The icosahedron leaves ~20% of the space in its circumscribing sphere empty. The dodecahedron leaves ~12% of the space in its circumscribing sphere empty. That means that if you start with a solid sphere (let's imagine it's something easy to carve, like soap!) and carefully cut away the 20 portions needed to turn it into an icosahedron, each of the 20 pieces you trimmed off will have volume of about 1% of the sphere. Similarly, if you do the same thing to carve a dodecahedron out of a sphere, each of the 12 pieces you trimmed off will also have volume of about 1% of the sphere. From now on, whenever I look at either polyhedron (icosa or dodeca) I will always think of it a little differently--because I will think of those ~1% extensions on each face needed to round it out to a sphere. On further thought, I am wondering about your figures of ~80% and ~88% above. Those percentage figures are the ratios of the volumes of the icosahedron and dodecahedron to pi, but the volume of the circumscribing sphere is (4/3)*pi. So I think the corresponding figures should be ~60% and ~66%. That means that each piece trimmed away to create the icosahedron is about 2% of the sphere and each piece trimmed away to create the dodecahedron is about 3% of the sphere. That actually makes more sense, when you think about it. It seems like the pieces of trim with the pentagonal bases would have to have more volume than the the pieces of trim with the triangular bases. This is really cool! I would never have guessed a dodecahedron fills more of a sphere than an icosahedron. I tend to make my models all the same side length vs. all the same circumradius length, so my dodecahedrons always looks larger than my icosahedrons. Way too hard! We played with some open-ended lesson planning for 6th grade "elective" extra math class instead. I was thinking about what you suggested, but if you think of volume as the sum of the cubes of the distances of the sphere from the center (sort of a 3-d polar integral?) and since all the distances are positive, squares and cubes follow in the same order (bigger squares mean bigger cubes), and the perpendicular distance from the sphere's surface will be along a radii, then the sum of squares from the surface is just a transpose of the center of integration... and will be in the same order as the volumes of the solids minus the sphere... of course this whole blog came about because I realized something I thought was true really wasn't..
Allen, good insight..that may explain it, ... oh, but wouldn't that indicate a reversal between the octahedron and cube since they are also duels and would have the same point-surface exchange happen? Indeed: my recipe would suggest that inside, the 8-vertex cube is bigger than the 6-vertex octahedron, and outside, the 8-face octahedron is smaller than the 6-face cube. Both are borne out by your tables. I am surprised that the r/R ratio (of the radius of the inscribed circle to the radius of the circumscribed circle) is the same for the dodecahedron and the icosahedron, and also for the cube and the octahedron. Is the inscribed/circumscribed radius ratio the same for any other pairs of polyhedron? Sum of Cubes, Square of sum..Potato/Po'ta toe?